Today is Father's Day. Skip the tie and give him the stars: SpaceWeather PHONE. NLC ALERT: Reports are pouring in of NLCs over Europe tonight, June 17th. Tomasz Adam sends this picture from Staszow, Poland. Soon, night will fall over North America and NLCs may appear there, too. Favored viewing sites include Alaska, Canada and northern-tier US states--the same places auroras are often seen. Click here for observing tips and photos. DAYLIGHT ECLIPSE OF VENUS: European and Middle Eastern sky watchers should be alert on June 18th for a mid-afternoon eclipse of Venus by the crescent Moon. Venus is bright enough to see in broad daylight, and having the Moon nearby makes it easy to find. Click here for time tables and a visibility map. Photo details: Nikon D70, ISO 200, 5 seconds. 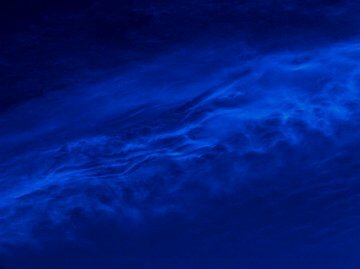 Jan Koeman of the Netherlands took the picture on Friday night, June 15th, when a vivid display of noctilucent clouds swept across Europe, descending as far south as France and Hungary: gallery. This latest display marks the second time since space shuttle Atlantis launched on June 8th that Europe has witnessed bright NLCs. Coincidence? Studies show that shuttle launches can promote noctilucent clouds. Exhaust from the main engines of NASA's space shuttle is about 97 percent water vapor, and this vapor can travel from Florida to the Arctic in little more than a day. Once there, it forms ice crystals for NLCs at the edge of space. The space shuttle cannot be wholly responsible for noctilucent clouds, which were first sighted in the 19th century long before space travel, but it may be a contributing factor to these modern displays. Photo details: Canon 350D, 28mm, ISO 800, f4, 35s. "The object started out patchy, shapeless and dim; it quickly brightened and formed a blue-tinted cone with a nose of magnitude -2 or -3," he says. The cloud raced across the sky "moving about 20 degrees per minute." More images: #1, #2, #3, #4, #5, #6. "It was shining blue and moving fast," agrees Amir Hossein Abolfath, another witness from Tehran, who snapped this picture. "Twenty minutes after I saw it, my friend Asghar Kabiri saw the same cloud 900 km away from Tehran in Sa'adat shahr." More images: from Muhammad Saber Karimi of Kermanshah, Iran; from Hossein Haeri Ardekani of Ardekan, Yazd, Iran. On June 15th at 11:12 am EDT, an Atlas V rocket launched from Cape Canaveral; its payload was a pair of National Reconnaissance Office ocean surveillance satellites. 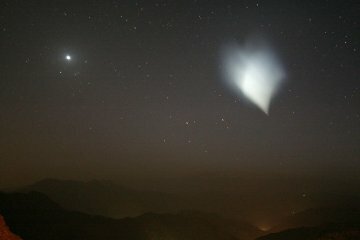 After the satellites were deployed--into the wrong orbit, according to media reports--the rocket's malfunctioning Centaur upper stage vented excess fuel, producing the Iranian cloud. The dumping of excess fuel is standard practice for Centaur-boosted launches, and this event is probably unrelated to the Centaur's reported malfunction. On June 17, 2007 there were 869 potentially hazardous asteroids.